Let's face it; I've tried a lot of protein powders in my time. I think by now I'm pretty good at telling whether a protein shake is good quality or not. I'd never heard of Purition before they offered to send me some of their products to review, and I was intrigued by the claim that all their products are completely natural, made with whole foods and no artificial ingredients. They're high protein, gluten free, high fibre, low sugar and contain natural fats (from nuts and seeds). I loved the fact that they came in single serving sachets (which you just have to add your choice of milk to) so you can take them with you to work, the gym...anywhere! They're also really filling - you could have one as a high protein breakfast, a mid-afternoon snack or a post-workout pick-me-up. You could also use the powder as an ingredient in smoothie bowls, overnight oats, protein pancakes and other recipes. The sky's the limit. As they're made with real food, they have a lot less sugar than a store-bought smoothie, are more filling than a meal replacement drink (think WeightWatchers, etc.) and offer more nutrition and sustained energy than a protein shake. As you can see from the above photo, they come in a range of flavours - my favourites were the cocoa and the coffee & walnut. I did have to add some honey to make them a little sweeter - they do have a bit of natural sweetness, but not much so you could add some fruit or honey/agave if you also have a sweet tooth. 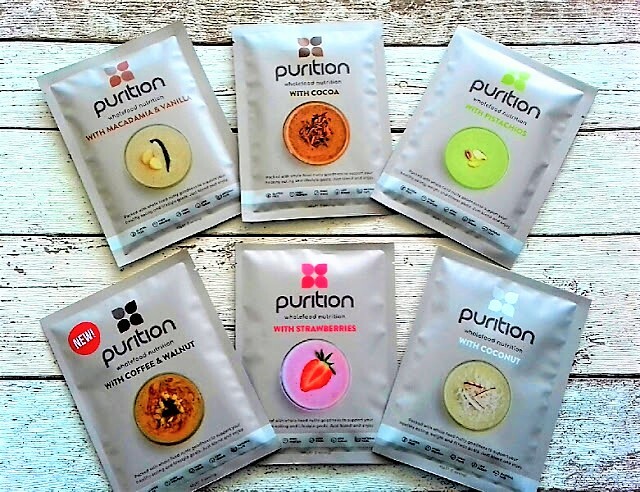 Overall I was really impressed with Purition's whole food powders and would definitely recommend them to anyone looking for a cleaner product to support gym gains, weight loss or just a healthier lifestyle. If you have a health, fitness or nutrition related product you'd like me to review, please contact me at nicspirational@gmail.com. I struggle to take protein shakes with milk so I mix a couple of spoons of pistachio Purition with yogurt and blueberries for a protein packed breakfast. I'm really intrigued by these protein powders! I'm really curious to try them! I might try to get some and give it a go! So far I haven't found protein powders that I like (but I haven't tried many anyway).